Greek food established its popularity long ago. 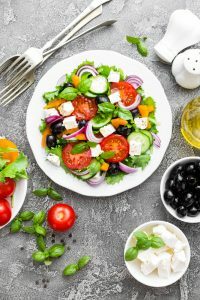 Due to its healthy nature and flavorful taste, Greek food is a genre that many are sure to love. Greek food is considered a healthy cuisine because of its typical ingredients. Many Greek dishes center around a type of lean meat or fish. You’ll commonly find pork, lamb, mussels and shrimp mixed with spices and herbs in different types of Greek recipes. You’ll also often find feta, the national cheese of Greece, in Greek dishes. Feta cheese can also only be produced in Greece, so it’s always 100% Greek. Beans are also another healthy ingredient found in Greek dishes. Because of the fertile wet soil in northern Greece, beans are popular for gardening and for cooking. One of the most common Greek dishes is Moussaka. This widely-recognized casserole consists of eggplants and potatoes layered with a spiced meat filling then topped with a creamy sauce. A popular Greek soup found on the menus of most Greek restaurants is Chicken Soup Avgolemono. This creamy soup typically serves as the first course for Greek holiday celebrations. 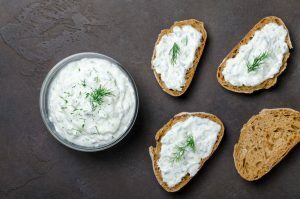 A popular appetizer that can also be used as a condiment is Tzatziki. This yogurt-based cucumber dip is the perfect dip for grilled meat, veggies or pita bread. 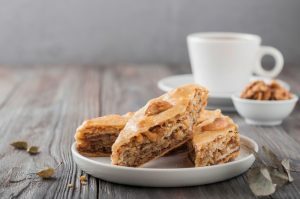 Baklava, a classic and popular dessert, consists of flaky phyllo dough layered with a cinnamon-spiced nut filling. Another delicious dessert consisting of flaky phyllo dough is Galaktoboureko. This custard pie is covered with a lemon and orange infused syrup. Shortbread cookies, known as Kourabiethes, are a classic at Greek family celebrations. These light yet rich-in-flavor cookies melt right in your mouth. 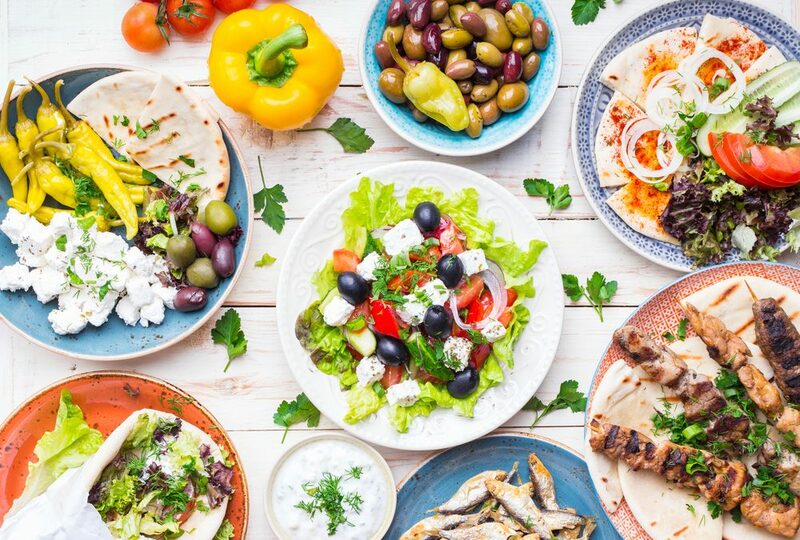 Greek cuisine is one that the whole family is sure to love. With the various ingredients used, there is something out there that will satisfy every member of the family.